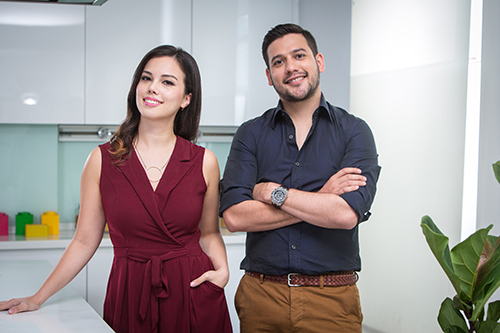 Back by popular demand, Asian Food Channel’s original series, Cooking For Love season 2 returns with tougher competition and more delectable recipes by culinary host Sarah Benjamin, and Malaysia’s celebrity chef, Nik Michael Imran! The brand new season features 6 new families of diverse backgrounds, following Nik and Sarah as they pit their kitchen skills and creativity to outdo one another and prove that the best way to a person’s heart is through their stomach. With each episode capturing a family’s unique story, the competitive duo not only tries to challenge each other but also themselves, as they draw culinary inspiration from each personalized story and create a menu especially for them. From intimate family reunions to grand Mother’s Day celebrations, find out who will win the most number of hearts this season! Culinary host and blogger from Singapore, Sarah Benjamin, began her food journey young, assisting her grandmother in the kitchen to make home-cooked Chinese Hakka dishes often. As Sarah grew older, her lifelong passion for cooking was ignited when she started cooking for herself during university in Scotland. It was the inability to order Asian food that motivated Sarah to experiment with various Asian flavors and dishes. The past 2 years have been a journey into culinary spotlight that has brought her across the globe traveling, eating and experiencing international cultures and flavors. In this season of Cooking For Love, Sarah is determined to bring a range of dynamic fusion flavors and influences from her travels to the table. Similarly, Nik began cooking at the age of just 9-years-old. Having grown up with a chef as a father, Nik was often encouraged to cook up meals for family and friends visiting. Trained in French and Italian cooking, with Malaysia palate influences and who also has a penchant for incorporating Japanese and Korean flavors, Nik truly brings a fresh take on traditional dishes, creating original yet accessible recipes that draw influences from East and West. With both hosts coming from different backgrounds and approach to cooking differently, this season’s competition is intensified. In one of the episodes, Nik and Sarah will take on the challenge to cook for a Thai Family. To add on to the challenge, both hosts will have to infuse Western flavors in the dishes they cook. Sarah whips up a plate of Green Papaya Rojak, Spaghetti Meatball Krapao and Kueh Salat while Nik cooked Spicy Squid Thai Salad, Norwegian Salmon Bakar Sambal with Jasmine Rice and Red Ruby Chestnut. Will they be able to satisfy the family’s authentic Thai palate and impress them with their creative take on Thai-Western dishes?